Defender Jacob Hanson has re-joined FC Halifax Town on loan from Bradford City until January 2019. The full-back, 20, made two appearances on loan for Town last season, but his first-team chances were hampered through injury. 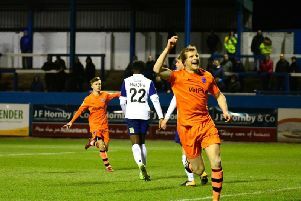 Hanson was at Huddersfield Town for six years earlier in his career and has made seven first-team appearances for The Bantams, scoring on his debut against Chesterfield in the Football League Trophy last August.